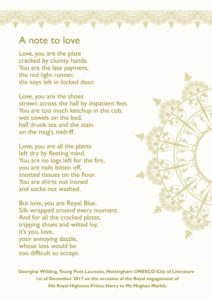 Young Poet Laureate for Nottingham, Georgina Wilding penned a fabulous love poem to mark HRH Prince Harry’s first official visit to Nottingham with his new fiancée, Meghan Markle on Friday. Georgina was appointed Nottingham’s first-ever Young Poet Laureate in September 2017, as part of Nottingham UNESCO City of Literature’s celebration of the city’s thriving live poetry scene. 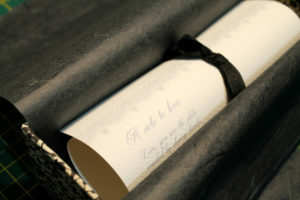 I was honoured to be asked by the City of Literature Team to create a pair of bespoke scrolls to present the poem and framed Georgina’s words with a design based on the decorative lace stonework over the windows of the Adams Building in the Lace Market. 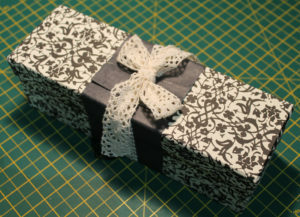 I then created two matching handmade boxes, tied the scrolls with ribbon and wrapped the boxes with a band of Nottingham lace. BIG UP to my Sneinton Market Avenues buddies, Corrina Rothwell and Helena Tyce for their printing panache!